Here are some facts about Alnwick Castle. Alnwick Castle is an 11th century castle, located near the town of Alnwick in Northumberland. It is about 30 km from the border between England and Scotland, and was built to control the border. 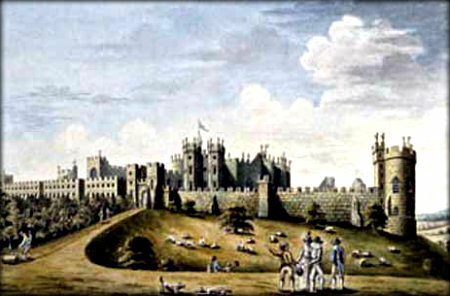 In 1309, Henry Percy, the first Baron Percy bought the castle. It has been in the Percy family ever since, and they still live in part of the building. Alnwick Castle played an important part in the Wars of the Roses, fought between the Houses of York and Lancaster. It was one of three castles controlled by the Lancastrians during 1461 to 1462. The castle became empty in the late 16th century. The designer Robert Adam carried out many renovations, and the castle was again decorated in an Italianate style during the 19th century. It is the second largest inhabited English castle, after Windsor Castle. It attracts over 200,000 visitors each year, making it the 10th most visited stately home in England. The castle has one of Britain’s best private art collections. It also has archaeological displays, including Ancient Egyptian artifacts, and is home to the Regimental Museum of the Royal Northumberland Fusiliers. One of the most popular areas is the ornamental garden, with its large collection of European plants. The gardens also have one of the largest tree houses in the world. The barbican is part of the castle’s strong defences, with 2 metre thick walls. Other defences included two baileys (or courtyards), a 7 metre deep moat and thick oak gates. A 15 metre deep medieval well can still be seen in the courtyard. 15th century cannonballs on display in the castle were found at the bottom of the well. Dozens of films and television programmes have been filmed at Alnwick castle. These include Blackadder, Robin of Sherwood, Star Trek and two of the Harry Potter films. What next? Discover more facts about castles by visiting our castle resources page. Very good information well done! This was really helpful for my homework thankyou!